Push the sunroof control lever forward or pull the sunroof control lever down. The sunroof glass and sunshade will close automatically. If an object or part of the body is detected while the sunroof glass or sunshade is closing automatically, it will reverse the direction, and then stop. The auto reverse function does not work if a tiny obstacle is between the sliding glass or sunshade and the sunroof sash. You should always check that all passengers and objects are away from the sunroof before closing it. 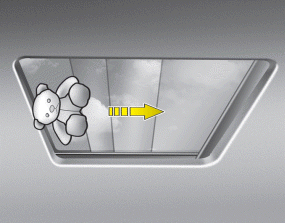 Do not extend the face, neck, arms or body outside through an opened sunroof while driving. Make sure your hands and face are safely out of the way before closing a sunroof. If you drive with the sunroof opened right after a car wash or rain, water may get inside the vehicle.